The Princess and the Goblin, first published in 1872, was one of the very first fantasy novels and had a strong influence on the work of Lewis Carroll, C.S. Lewis, and J.R.R. Tolkien. Fans of fantasy-fiction love it to this day. Eight-year-old Princess Irene lives in a remote mountainous region with no one but her nursemaid for company. Then she meets a mysterious old woman and Curdie, a young miner. Meanwhile, deep in the heart of the earth beneath her lurk grotesque and hideous creatures seeking vengeance against human kind. 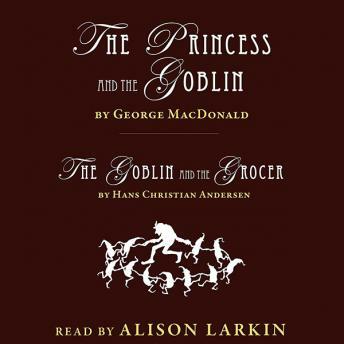 The Goblin and the Grocer by Hans Christian Andersen is a short fairy story about a very different sort of goblin who must choose between poetry and an edible Christmas treat. I really enjoyed this story! The narrator was absolutely excellent! I highly recommend this book for the whole family!